Dr. Peter Haughton was the  New Paltz campus physician at the time of the PCB disaster. 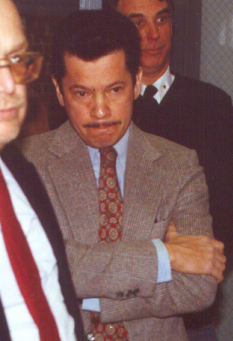 This  was his reaction during the first news conference held the day  after the explosions and fires, Dec. 30, 1992. He later joined  the chorus of voices reassuring students, parents and faculty  of the safety of the campus and buildings. Nine years later,  this photo says it all. We left the news conference  when it ended and went exploring. This mystery turned out to  be the "staging area" outside Gage Hall, from where  emergency crews ran their search & rescue and other emergency  operations, and where students and other exposure victimes had  their clothing and jewelry taken from them the day before. They  were then shuttled to area hospitals in ambulances wrapped in  blankets; there were not enough ambulances in the region to take  everyone at once. Doctors told them to go home and shower with  soap; there was nothing that could be done for them. The photo  below is about 200 feet from the stagine area, though about three  weeks later. Some weeks  later, we watched as workers began the process of undong the  damage. 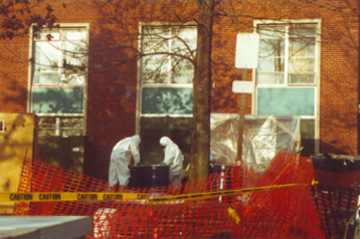 Here, haz-mat men in level B work outside Gage Residence  Hall,  which college officials informed parents would be closed in the  spring semester of 1992. That seemed obvious enough. But at the  last minute, the 370 students were given the go-ahead to move  back into the building. Thus began what in the lingo of the cleanup  became known as the "Gage-type scenario," in which  students were allowed to live in a building either while cleanup  workers did their jobs, or with decontamination taking place  during vacations. 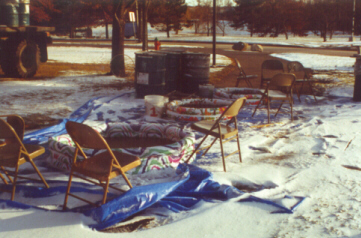 A barrier fence was put up between the street  and the clean-up project, but students could watch from their  rooms. Gary Pinsky-Adamson said he would give coffee to haz-mat  workers out his window in Gage Hall, which was opened just 33  days after an explosion sent smoke flooding through the building.  In the words of firefighter Patrick Koch, one of four volunteer  firefighters to enter the building, "All you saw was smoke." Over the  next three years, I would work through Woodstock Times, with the help of  a gadfly state official inside the Department of Environmental  Conservation named Ward Stone, and with the direct help of the  Governor's office, to establish that the vents in Gage Hall had  never been cleaned, had never been tested, and were in fact contaminated.  In the summer of 1994, the state performed an "arm's length  cleanup" of the vents and moved students back into the building,  once again reassuring them of its safety. Thus, the Gage cleanup  went on for three years with students living in the structure.  Today 370 students live there. No tests have ever been run on  heaters or heating conduits, and the vents remain contaminated  just 24 inches inside the grates.